Hard to see in this image, the installation consists of a pattern of bars and crosses (discernible in the lens reflection) which turn on and off every couple of seconds. It may be a leftover Christmas decoration, but I didn’t notice it before January 14, when it was active even after midnight. The images above and below were taken around 22:40 local time on January 15. The installation seen from Arecida, at 2.5km distance. The white LEDs contrast with the light-pollution friendly amber colored streetlights. 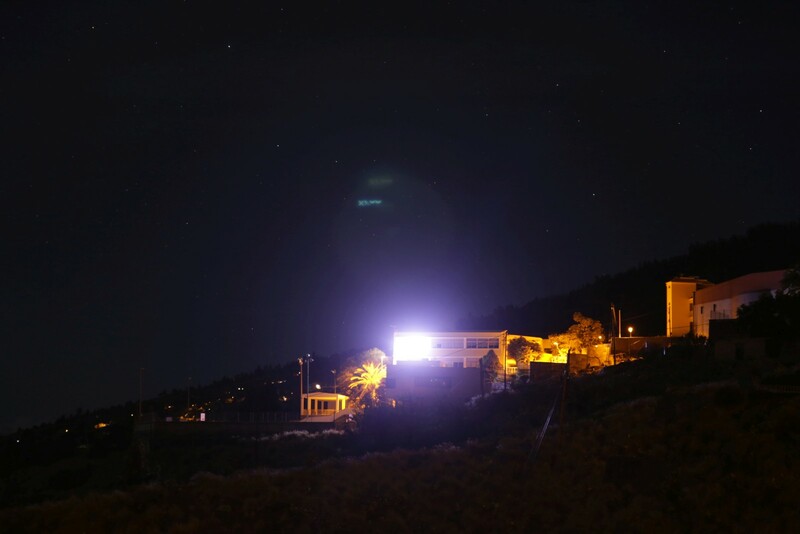 They cause glare and noticable skyglow over Tijarafe. Artificial sun and an insect deathtrap. This is just not good, especially at night time, somebody needs to tell them to throw this luminaire into trash.